In a time of fiscal austerity, open architecture systems provide a means to integrate varying systems and enable warfighters to leverage the full capabilities of these systems. Michael Zalle has been the driving force of Sales and Marketing for Squire Tech Solutions since May of 2008.
Who owns space? All of us? None of us? These questions are becoming increasingly relevant. In organizations around the world, “studying” a problem is often just a way of postponing a difficult decision. Only eight years ago, iPhone3 and Android devices debuted with Global Positioning System capabilities and leveraged the U.S. investment in location-based satellite technology for the benefit of commercial industry and consumers. 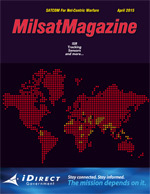 A Keysight Technologies FOCUS: Using Commercial Best Practices For Success In NewSpace, This happens to be a most exciting time in the space business. The industry is energized and changing rapidly. The term NewSpace has emerged to describe these changes. History has seen many different industries make the transition from low volume and high cost to high volume and low cost. Ensuring product quality through such a transition is a difficult task. There was no mistaking the excitement in the air all throughout our recent 31st Space Symposium.